When I was a kid, every summer the TV news folks would choose a very hot day to go downtown, spread aluminum foil on the County Courthouse steps and crack an egg onto it. They then proceeded to tell jokes about how hot it was. I don’t ever remember the egg getting cooked – but the image stayed with me. 35 years later I saw my first Solar Oven. It was sitting on the ground and contained a nicely browning turkey – in February. 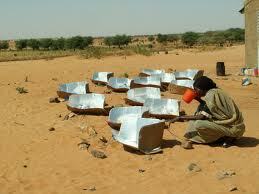 Solar Cookers have made a splash all over the world in the last 10 years. In many countries of Africa, there are villages that have little in the way of firewood for cooking, Sun Cookers, International is a non-profit group that raises money to bring Sun Ovens made from foil covered cardboard with oven roasting bags to these areas. A pot of rice and beans placed into this arrangement will cook food for the family without the women having to spend hours searching for a few small sticks of firewood or dried dung. There is a town just outside Mexico City wherein the women’s association has built a large solar oven. Panadaria Solaria is the name of their bakery, which supplies most of the village’s bread. A simple solar oven is made from lining a shoebox with aluminum. Paint the outside of a quart canning jar Black. You can put hotdogs or water or anything that needs warmed inside the jar. Place the jar inside the box and tilt it towards the sun. On a sunny day it should only take 15 to 20 minutes for it to be ready. There are many plans for building oven sized solar cookers from cardboard or wood, and there are several kinds of solar cookers that are considered to be serious appliances. The Global Sun Oven is one such appliance. It has petal-like reflectors and tempered glass doors. It can reach 425 degrees in summer, and even in winter will cook the evening meal – as long as there is sun! The beauty of this one is that it folds up quickly, weighs only 21 pounds and is easily transportable. It can be used during camping when the forest service won’t even allow camp stoves. It contains a temperature gauge and a suspended platform that keeps food upright even when the box is tilted to gather maximum sunlight. There are also several parabolic cookers – curved surfaces that reflect light toward a pot suspended at the point where the light is focused. These can achieve higher temperature, and are very good for frying. They usually are not as easily portable as the box cookers, but do very well at boiling the morning coffee! Although most of us in the United States don’t have the problems faced by the women in Africa, there are several advantages in using Solar Cookers in the sunny Southwest. It reduces the amount of gas or electricity we use with regular stoves – lowering the utility bill. It reduces the amount of heat we generate when using conventional stoves indoors – so our air conditioning does not have to blow out the heat – again reducing the utility bills. There are subtle and important differences between a solar oven and the electric or gas ovens we find in most kitchens. One involves the temperature fluctuation during cooking. This is especially important at lower temperatures. There are many ways to build homemade solar cookers and I have listed some websites where you can get that information below along with locations where you can buy the professionally built solar cookers. 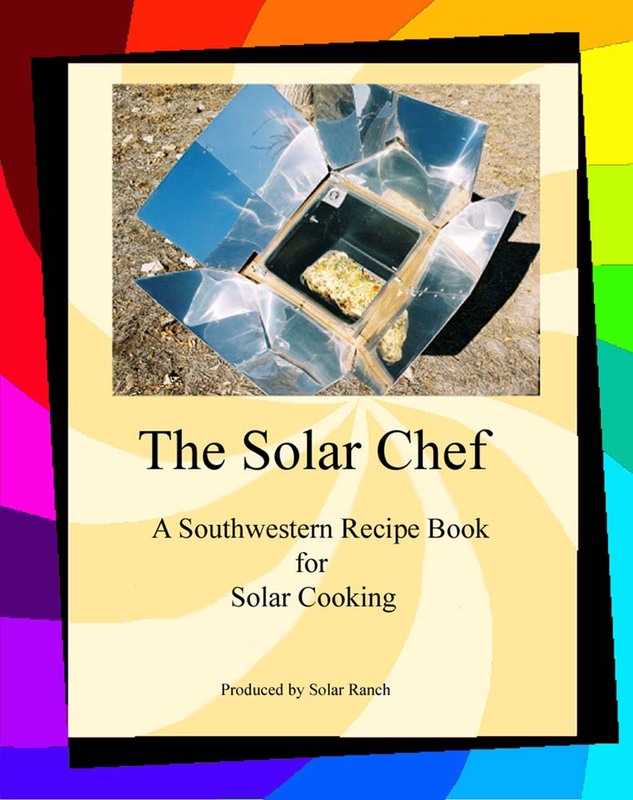 Most of these books are focused on the creation and promotion of solar cooking. They contain recipes which are usually simple, though tasty, in nature. 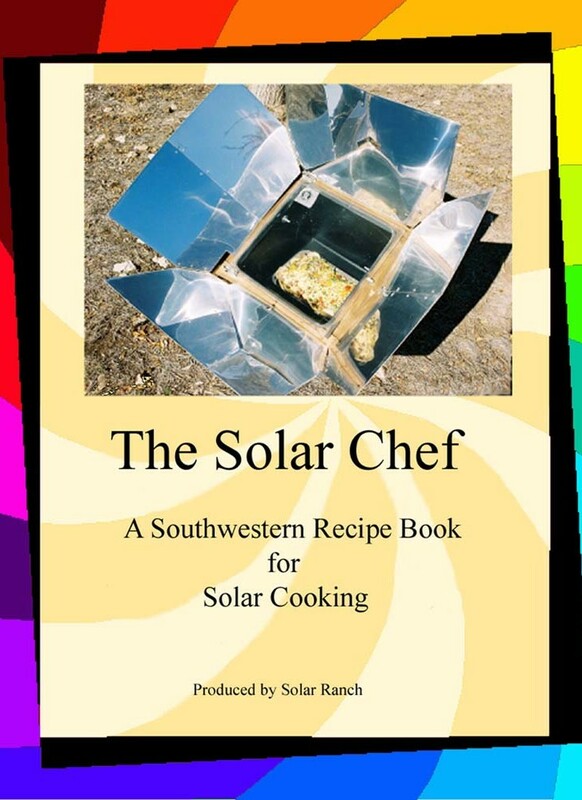 My book, “The Solar Chef” is filled with time tested recipes and tips for cooking with sunlight, many of them are examples of true gourmet cooking. 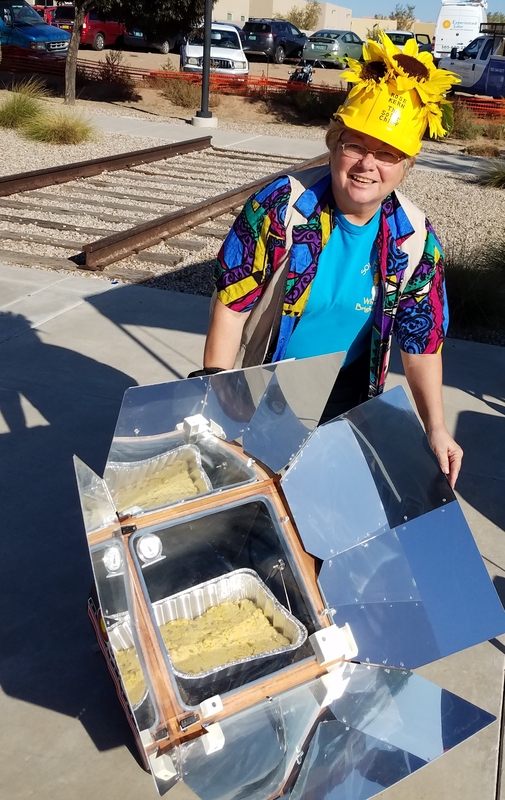 From soups to bread, solar cooking is a treat and a joy. So turn the pages and bask in the Sun! In this cookbook at the top of each recipe near its name you will one or more of the abbreviations listed below which describes the kind of sky condition necessary to cook the recipe. For instance: (SKC) means clear skies and full sun only (PC) means you can cook in either clear skies or partially cloudy skies can have some high wispy clouds or a few mid level fluffy cumulous clouds. Over time you will acquire a feeling for when the cloud cover is simply too dense to cook in. Just remember, the more clouds the slower the cook time. This may not affect the soups and all day dishes very much, but the breads, eggs, and desserts frequently require hotter temperatures. One thing that I have noticed is that clear skies at or near sea level is a very different thing from clear skies in the higher altitudes of New Mexico, Colorado and Arizona. That extra 5000 to 7000 feet of atmosphere can diminish the ovens temperature somewhat, though the people in Wisconsin will tell you that they can still make some great solar foods!